Consider the following, where the point is the intersection of the sphere and a tangent plane. Blue dot is the origin (0,0,0). Z-axis passes through the dot and the SphereCenter. 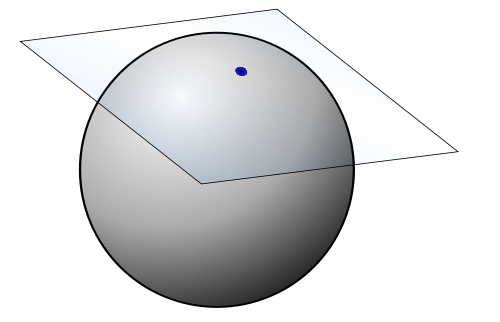 SphereCenter = (0,0,-1). The tangent plane is the X-Y Axis, (x,y,0), aka Z=0. Now consider LineThrough((1,0,0), (1,1,0)). This would lie in the XY plane, but would not intersect the Z axis. Would that skew line be considered perpendicular to the Z axis? I know a projection could be perpendicular, but the skew line itself? I don't understand this comment. I was making a "mathematical joke comment", but I want to be sure my math is still good. (What good is a math joke if the math is no good!) Is Jeppe saying any skew line in that plane is perpendicular to the Z axis? If so, I learn something new. If not, I'm not sure what Jeppe's point is. Jeppe is indeed saying that. One definition of perpendicularity that may or may not help that make sense is the that involving the dot product. This definition says that two vectors $v$ and $w$ are orthogonal (or perpendicular) just if $v \cdot w = 0$. How to explain the perpendicularity of two lines to a High School student? Can this be considered a definition of a cone?